Our Experts provide the skills and equipment to throw the most amazing glow parties, blacklight parties and neon parties in the known Universe! At Glow Party Experts, “Glow” is literally our first name! We have the coolest job in the world – we provide audio, lighting, staging and generators for large-scale Glow Parties! Whether your party will be held in a hotel ballroom, a high school gymnasium, or even an outdoor parking lot, we provide everything you need to have an EPIC party. Our professionals have experience in all the coolest technologies – UV lighting, confetti cannons and blowers, CO2 effects, lasers and even paint and water cannons. Our client base consists of corporate parties, outdoor sporting events and family events such as bar/bat Mitzvahs, wedding receptions and birthday parties. We travel the nation, providing our turnkey event services for our clients – and they are never disappointed. Time after time, our clients tell us it’s the best party they’ve ever attended! If you are planning a college event, you are in your own league altogether – Click here for more information on college events. Glow Parties use lighting, effects and audio to provide an exciting, interactive party atmosphere. Glow Parties (they can also be called UV Parties, Blacklight Parties or Neon Parties) use three principal elements to ‘glow’: Glowsticks, LED battery operated items and blacklights. Most Glow Parties have a DJ, although we have certainly provided bands with our parties as well. Glow Parties are extremely customizable – some parties use confetti effects while some use LED Dance Floors. At Glow Party Experts, we provide the glowing elements as well as the audio, staging and party lighting. Our experts can provide talent, can work with the venue and provide generators for power. Our typical party size for indoor events is 1,000 or more attendees. 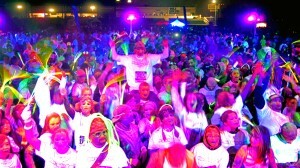 For outdoor events, we routinely cover 15,000 to 20,000 people with high-intensity UV lighting. Let us show you how we can provide a full-service Glow experience that your attendees will never forget. Are you ready for your Glow Party? Then Ask Us a Question of our Glow Party Experts today!